Insulation is an often misunderstood concept. People associate it with keeping warm: when purchasing a jacket or coat for cold weather, shoppers look for an item with effective insulation. They also think the same way about the insulation in the walls and ceilings of their homes: they help keep the house cozy during the winter. But insulation is both for keeping warm and for keeping cool. What insulation actually does is stop the movement of heat with a thermal barrier. In cold weather, house insulation traps heat indoors to help people stay warm. In hot weather, the insulation prevents heat from entering a home and raising the temperature to uncomfortable levels. If you are finding it difficult to stay cool this summer in Delaware, OH, insulation may help you. Contact Quality Air Heating and Air Conditioning today to find out more about what we can do to help your home stay cool during the summer. If it seems that you have your air conditioner running all the time, yet you never feel comfortable enough, than the reason may be inefficient insulation allowing excess heat indoors. Not only is this bad news for your comfort, it is bad news for your air conditioning. The AC will work overtime trying to lower the indoor temperature while more heat pours. Adding insulation to the walls and attic will reduce the strain on your cooling system, and that means much lower bills for electricity. It also means an air conditioner that is less likely to suffer from malfunctions and breakdowns, and which will enjoy a much longer service life. A specific area to focus on in your home when it comes to insulation is the attic. This region of a house will grow hotter than any other during the summer, since the sunlight beats down on the roof and the radiant energy raises the temperature to extreme levels, sometimes higher than 130°F! Without a thick barrier of insulation between the attic and the rest of the house, this heat will drift downward and can raise the indoor temperature 10°F or more—a significant amount that can mean the difference between whether the AC is kept on or off. If you are planning to have new air conditioning installation this summer, your installers can perform a heat load calculation to see how well your home traps and releases heat. They can then tell you if you will benefit from more insulation. 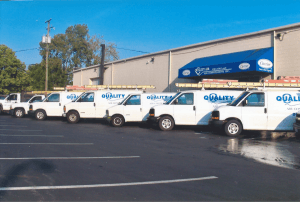 Call Quality Air Heating and Air Conditioning today and let us advise you about air conditioning installation and our indoor air quality services in Delaware, OH.